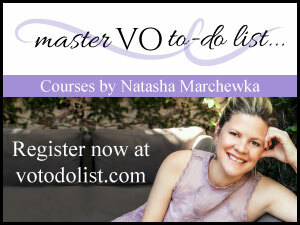 (VOXtra) - Audiobooks dominate the award categories announced for the 1st Annual Voice Arts™ Awards competition, yet nominees are also plentiful in categories ranging from national and local radio and TV commercials to video game characters, movie narration, TV program narration, Spanish language voiceover, promos, TV animation, demo reel categories and podcasts. Sponsored by SOVAS (Society of Voice Arts and Sciences), the international competition is designed to showcase the best work encompassing all aspects of the voice over business. 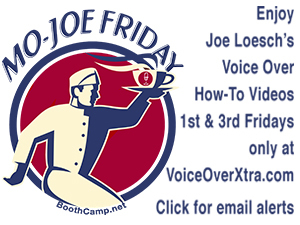 Winners of this year's competition will be announced and honored at the 1st Annual Voice Arts Awards Gala on November 9, as the kickoff event of the 5th Annual That's Voiceover career event at the Museum of the Moving Image in Astoria (New York City), New York. 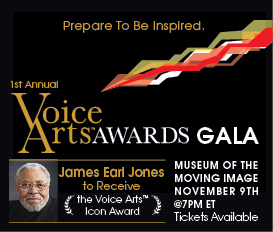 At the Gala, iconic actor and voice actor James Earl Jones will receive the Voice Arts™ Icon Award for lifetime achievement. SOVAS reports that participants this year included entries from CNN, NBC Sports, Kettle One, ABC Entertainment, Comedy Central, Oxygen Network, NBA on TNT, FOX, Ovation Network and many others. "It's an unexpected thrill to see the courageous ones who took a chance on a new venture and put themselves into the thick of possibility," note SOVAS CEO Rudy Gaskins and Board member Joan Baker. "They also took a chance on themselves," they said. "We believe it comes down to the basic human need to connect with others. Acknowledgement is one of the highest forms of our humanity. It's an act of sharing and sharing is what makes our lives complete. Awards, hugs, applause, a pat on the back, a thank you - these acts complete us and inspire us to keep going. "We look at the list of nominees and all the entrants whose names don't appear here, and we feel the acknowledgement of the believers. And with that, we too are inspired to keep going." Competition jurors were voice over industry professionals in categories of their expertise, including Scott Brick, Michele Cobb, George DelHoyo, Dave Fennoy, Cedering Fox, David Lewis, Barbara Ransom, Frank Rodriguez, Paul Ruben, Rodney Saulsberry, Trish Scanlon, Sylvia Villagran, Janet Wilcox, Nancy Wolfson and Denise Woods. The awards program is overseen by Steve Ulrich, a 5-time Emmy® winner, Executive Director for the SportsEmmy® Awards and the Executive Director of the Voice Arts™ Awards. Joe Cipriano, Living On Air, Joe Cipriano Promos, Inc.
Janis Ian, The Singer and the Song, Audible, Inc.
Kevin Pariseau, Ilium, Audible, Inc.
Sean Runnette, Indian Hill 4: From the Ashe, Audible, Inc.
Karen Chilton, Sand: Omnibus Edition, Audible, Inc.
Sam Harris, Lying, Audible, Inc.
Mary Robinette Kowal, Valour and Vanity, Audible, Inc.
Sophie Eastlake, Dragos Takes a Holiday: A Novella of the Elder Races, Audible, Inc.
Felicity Munroe and David Benjamin Bliss, Forever Black, Audible, Inc.
Elizabeth Powers, Mile High: Up in the Air, #2, Audible, Inc.
Scott Aiello, Eve Bianco and Jay Snyder,Deadlocked 5: Aftermath, Audible, Inc.
Scott Aiello, Eve Bianco and Jay Snyder, Deadlocked 5: Aftermath, Audible, Inc.
Grover Gardner,The Path to Power, Audible, Inc.
For more about the Voice Arts Awards and Gala on November 9, visit: www.VoiceArts.org. 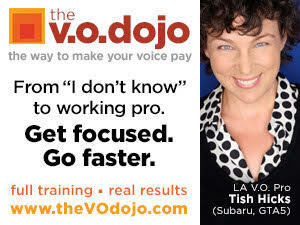 For more about the That's Voiceover career event on November 10, visit: www.ThatsVoiceover.com. Why Enter An Awards Competition?